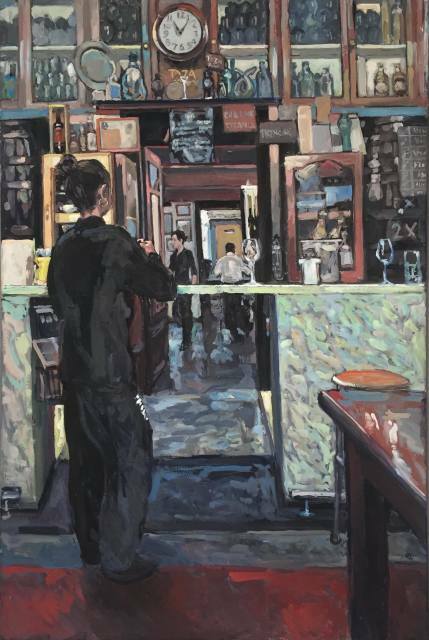 Hector McDonnell is a realist painter, depicting interiors and landscapes of seemingly mundane places - New York launderettes, French cafes, Indian barbers, small Irish country shops and even lavatories. Hector McDonnell was born and raised at Glenarm in Co. Antrim, the youngest son of the thirteenth Earl and Countess of Antrim. After leaving school in 1964, McDonnell travelled to Munich and Vienna to study painting and sculpture, working for a time in the studio of Hans Wotruba, the last of Vienna's great Secessionist sculptors. McDonnell then went on to Oxford, taking a degree in History, but spent many of his afternoons life-drawing at the Ruskin, and by the time he finished his course, he had decided to become a painter. McDonnell has exhibited widely in Europe. In 1979, he won one of Germany's most illustrious art prizes, the ‘Darmstadter Kunstpreis’ which resulted in a major museum exhibition at the Kunsthalle Darmstadt, featuring over 200 of his paintings, drawings and etchings. He is a keen traveller and always carries his notebooks and pencils with him so that he can sketch wherever he goes. He currently divides his time between his homes in Co Antrim and New York. A major retrospective of his paintings was held at the Ulster Museum Belfast in November 2003.